3 night's accommodation in Punta Arenas, a night either side of the trek (based on twin share, breakfast included) Single Supplement will be charged for single travelers). Cross the famous Gardner Pass, trek to the mighty Torres del Paine towers. Local Indian expert English speaking trekking guide. Transport from Punta Arenas to start of trail return. Our Guides and crew accommodation, food and repatriation home. All meals and accommodation as per indicated on itinerary. Accommodation in mountain tents. We use the highest quality expedition tents. (Based on twin share) Single supplement will be charged for single travelers. 5 nights camping fees, including all equipment. International airfares-We have a prepared flight schedule that we can assist you with. Tips guides, porters, restaurants, drivers, Eco Camp, refugio's, camp cooks there is a standard fee. When packing, we need to section our gear into 2 x 20-25lt dry sacks. A dry sack is a water proof bag that you can purchase at outdoor shops. Soft suitcases are preferable to travel with than a hard suitcase. I use a large Mountain Design soft bag that has wheels. But don’t go out and purchase one specifically for this. We can get by with hard suitcases. The porters have their own large packs and will carry your 2 dry sacks in those. Try not to have them too bulky as become too hard for them to pack. Day Pack: Below is what we will either be wearing or carrying in our 35 litre day pack. Make sure you day pack is comfortable, with shoulder straps and waist straps. First Aid, Panadine etc, sports tape, if you have a niggly injury e.g knee/ankle bring along strapping for that. This must not weigh more than 5kgs. Sml Dry Sack or zip lock bag- Into this goes clean clothes that they will deliver to us at the half way point. They will take your dirty clothes back to Eco Camp. We normally wear the same underwear and socks for the first 4 days and only bring into the half way point 1 set of clean undies and socks for the next 4 day. It is cold so we do not sweat and smell like we do in the tropics. But if you want to change your underwear and socks only take in 1 extra set for first four days and 1 extra set for last four days. We can leave a bag of clean clothes at Eco Camp. We are tenting for 5 nights. A bag can also be left at the hotel in Punta Arenas if required. Very important that trekkers have everything on the gear list. This 7 day trek along the Torres del Paine Trail, is one of the world renowned trekking routes in Patagonia, Chile’s most famous national park. 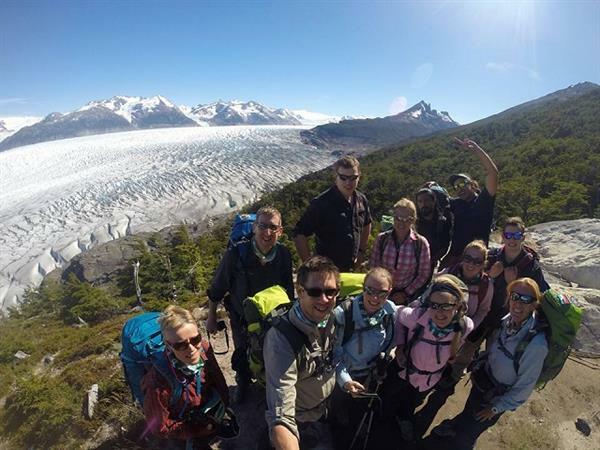 The trail is located in the south of Patagonia, approximately 2500kms from Santiago and is an internationally acclaimed trekking destination providing our trekkers with panoramic scenery, exotic wildlife and diverse ecosystems. Torres del Paine is recognised as one of the most breathtakingly unspoiled places on earth, being declared a World Heritage site in 1978. The spectacular Pine Massif, with peaks Cuernos (Paine Horns) and Grande, dominates the panoramic landscape of the park. We will trek through numerous ecosystems including, carving glaciers, snow-capped mountains, cascading rivers and waterfalls, lush meadows, mirror like turquoise lakes, Magellenic forests and arid Pampas. Expect to see birds like the Andean Condor, American ostrich, Cara Cara’s and Pink Flamingos. Mammals such as Guanaco’s (like Lamas) Gray and Culpeo Foxes and possibly Pumas. Note the trip is fully supported by pack horses and/or porters so you will only need to carry a day pack. Your experienced English speaking wilderness guide will be assisted by a cook who will take care of the practical arrangements while on the hike. Pam and Pauline are experienced, trained mountaineers who will provide the safest and most beneficial experience leaving you free to enjoy the jaw dropping scenery and pristine wilderness scenery. For those of you out there that are not trekkers we do have non walking Safari's available. This is a luxury package and ideal for those partners who wish to experience Torres del Paine by coach rather than walk with their partners the full track. Please inquire direct with Pam regards this. The trek commences and finishes in Punta Arenas. Depending on international flight arrival times clients may not be able to connect with domestic flights into Punta Arenas. If this is the case PNG Trekking Adventures can book accommodation for clients in Santiago.